Actually I designed this schematic to be used with Pico Wind Turbine With Bicycle Wheel. But it could be used as a regulator for battery charger by adding a transformer to connect to the grid. More detail about recharging battery in article "Charging Your Vehicle Battery". Some wind turbines use dump load system to dump excess power when battery fully recharged. 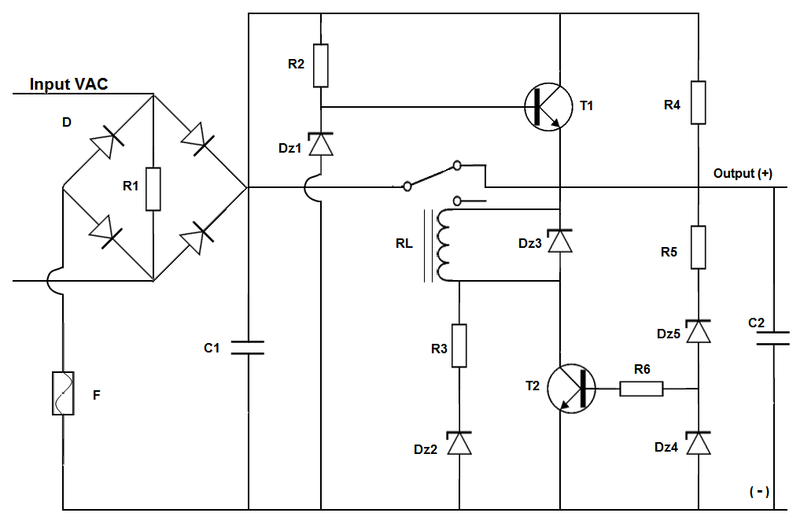 This circuit will cut-off power from wind turbine when battery is fully recharged. This way will let wind turbine runs freely when battery fully charged, thus will also save wind turbine from overload. Also when high wind, wind turbine will produce too much power, and this cut-off regulator will cut power to battery and let wind turbine runs freely to avoid damage by high wind. But the wind turbine must stand high centrifugal force when it runs freely. As the circuit is using 5 pins SPDT relay, it can be designed also to become a wind turbine dump load system to avoid wind turbine spinning wildly without load. It can use 12 volts 30 watts bulb as dump load. Too much dump load will bend turbine blade and burn dynamo when high wind. D is a diode bridge with a capacity of 10A current, maximum voltage is 500 volts. This diode bridge requires heatsink. Input section is connected to the dynamo powered by the wind turbine. If the circuit is used for the battery charger with a transformer, the input cables are connected to the output of transformer. Suitable voltage of transformer output is 15 - 16 volts. Fuse F value is calculated based on the battery capacity will be recharged. Battery charging current is 10% of the battery capacity. Charging current for 50Ah battery reaches 5 amperes. So the value of F is also about 5 amperes. Zener 1 (Dz1) determines the output voltage of T1, if the value is 15 volts then Dz1 T1 output is 14.4 volts. Zener 5 (Dz5) determine the cut-off voltage of the relay, with Dz5 valued at 14 volts then the relay will be activated and cut-off when the output voltage slightly above 14 volts. This voltage is suitable to recharge wet cell battery, but not suitable for dry cell battery which has a charging voltage of 13.5-13.8 volts. If you need to design a circuit with different voltage, then both zeners (Dz1 and Dz5) must be replaced. Transistor: T1 & 2 = BD139 ; download BD139 datasheet. Transistor 1 (T1) maximum current of about 0.1 amperes at voltage of 14.4 volts. This transistor only works when the relay is activated (cut-off). The transistor current helps relay not too often connect and disconnect (on and off) and causing relay vibration and greatly reduces relay life. Voltage of 14.4 volts is the zener 1 (Dz1) voltage (15 volts) minus voltage loss in transistor 1 (T1) as much as 0.6 volts. This transistor is quite strong and can stand high collector-emitter voltage (Vceo) 80 volts. 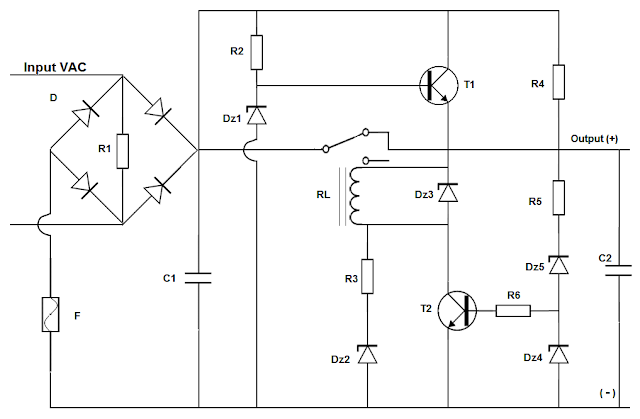 This is one reason why this circuit is used for voltage regulation for Pico wind turbines. Transistor 1 requires cooling. Transistor 2 (T2) provides current to activate relay which will disconnect diode bridge to condenser or battery. Transistor 2 will only work if the voltage at the battery or condenser 2 (C2) already exceed 14 volts. This voltage is determined by the 14 volt zener 5 (Dz5). Transistor 2 may need cooling, depending on to required current to activate relay. Relay: SPDT (Single Pole Double Throw) 12 volt and 400 ohm coil, 5 pins, maximum current of 7 amperes DC. Relay will only activate and cut-off if the voltage on the condenser C2 has reached above 14 volts. If there is a battery on the output, the relay will cut-off if the battery voltage reaches above 14 volts. This 7 amperes relay can be used to recharge battery with capacity up to 50 AH safely. The output voltage depends also on this relay, fluctuating between 14.1 - 14.3 volts. If a battery is connected to the output then that voltage fluctuations will be stabilized. The circuit is very efficient, as there is no component in that circuit work or consume power before the output voltage on the condenser 2 (C2) or the battery voltage reaches 14 volts. There's only voltage loss of 1.2 volts in the diode bridge, and very small current loss on resistor 1 (R1). Resistor 1 eliminates high voltage from magnetic field induction in dynamo or transformer. Diode bridge or full wave rectifier is suitable for use when regulator is supplied by a transformer or alternator, so that all waves of alternating current can be used. Diode bridge can be replaced by half wave rectifier (one diode) if the regulator is supplied by dynamo that generates direct current, such as dynamo of wind turbine. Diode in regulator for wind turbine with dynamo has function to prevent current flows from the battery back to the dynamo. Voltage loss of a full wave rectifier is 1.2 volts because the current passing through 2 diodes. Voltage loss on half-wave rectifier is only 0.6 volts. Some advantages of regulator with cut-off relay when compared with transistor regulator, there are: relays are available widely with cheap price, large current capacity, small size and does not need cooling, resilient to high voltage. That's why it was decided to use a regulator with cut-off relay for voltage stabilization in battery charger that is using Pico wind turbine as a power source. Circuit to monitor the battery voltage can be read in the article "Simple Battery Voltage Indicator With LED".